We’re back from Portugal. Just before we drive to the airport to catch our flight I pick four lemons to put in my suitcase. A lovely souvenir, warm to the touch. Lemons ripen in early spring. It’s the end of July now and these are very mature fruit, large and gnarled, the dark yellow peel overlaid with pale brown freckles. They are all the more fragrant and juicy for it. My suitcase goes missing and when it turns up the next day, I am especially happy to see the lemons again – much more attractive than the huge carrier bag heaving with dirty laundry which is also inside! Most of the lemons go into the fridge to make them last a little longer, but I can’t resist using one right away. A little of the grated peel adds a delicious edge to this rich risotto. 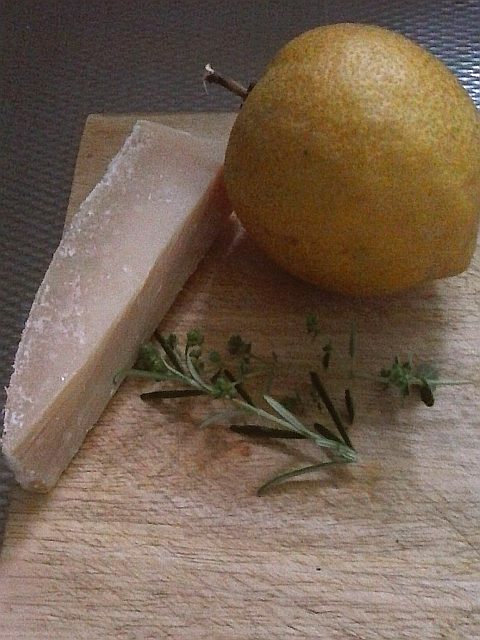 If you can only get a waxed lemon, wash and dry it before grating. Put the stock in a small saucepan, bring to the boil, then lower the heat to a slow simmer. Meanwhile, melt half the butter and the tablespoon of olive oil in a medium saucepan. When it starts to bubble, add half the garlic, stir through and before it starts to brown, add the rice. Stir in the wine. When it has been absorbed, add a ladleful of the hot stock and stir until it has also been absorbed. Now keep adding stock little by little and stirring frequently until the rice is cooked but still soupy – this will take about 20 to 30 minutes. Make sure it doesnt catch on the bottom of the pan. Meanwhile soften the onion and the other half of the garlic in the teaspoon of oil in a small frying or grill pan. 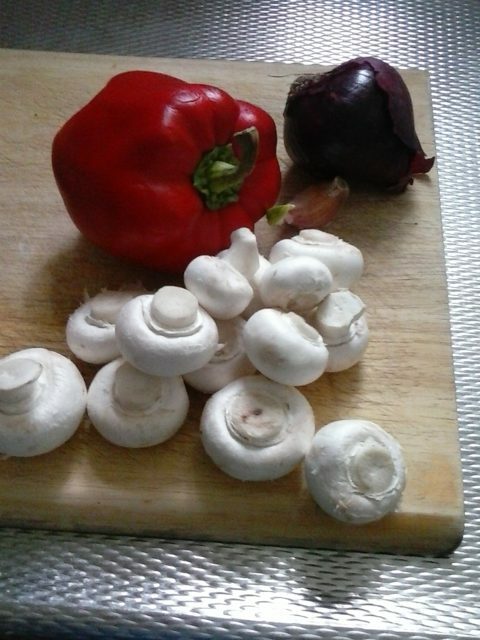 Now add the mushrooms and pepper and cook until just done. Turn off the heat and season to taste. When the rice is done, turn off the heat. Tip in the rest of the butter, the cheese, the lemon peel, the vegetables and the herbs. Stir through lightly, put the lid on the pan and leave to rest for 5 minutes. Stir one more time and taste for seasoning. Serve hot with extra Parmesan and a salad of bitter leaves.